At Serene Dental Spa, we provide a new definition of what dental treatment is - and what it should truly be. 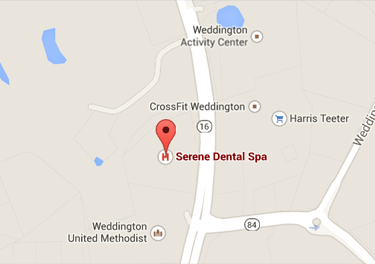 Our Weddington dental and spa office is designed with your comfort and relaxation in mind, offering custom-designed treatments to renew the health and appearance of your smile. Come on in to enjoy an oasis like you’ve never experienced before in the Weddington-Matthews, NC area. We offer an ultra-hygienic environment where luxury meets wellness. Our spa is one of a kind. Relaxing. Quiet. Great Energy. Pamper yourself at Serene Dental Spa with services such as massage therapy, manicures, pedicures, aromatherapy in addition to all your dental needs. Let us exceed your expectations with our luxurious and therapeutic care.